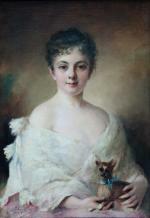 This portrait of a lady with her favorite dog was executed by famous French painter and engraver Charles Joshua Chaplin (1825 - 1921). He was born in Les Andelys, Eure , France to an English father and a French mother. Although he spent the whole of his life in France, he only became naturalized in 1886. He died in Paris. Chaplin conducted art classes specifically for women at his studio. 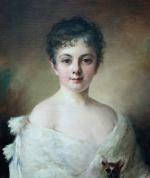 The American artist Mary Cassatt and the English artist Louise Jopling were among Chaplin´s students. Paintings by Chaplin can be find in the world museums: Hermitage, St.Petersburg; Louvre and Orsay, Paris; Metropolitan Museum, New York. Literature: Artist lexicons by Thieme/Becker, Benezit, Saur. 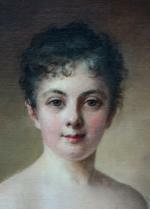 Technique: oil on canvas. 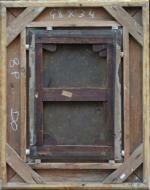 Magnificent antique gold-plated frame. Measurements: unframed w 12 3/4" x h 18 1/8" ( 32,5 x 46 cm), framed w 21 1/8 " x h 26 3/4 " (53,5 x 68 cm). 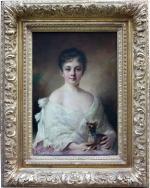 Condition: very good, original canvas, no any inpaintings or paintlosses.